Tommy Lee Jones will be hunting down Wesley Snipes on Blu-ray this summer. In an early announcement to retailers, Warner Brothers is working on 'U.S. 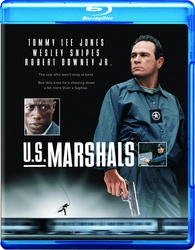 Marshals' for Blu-ray on June 5. Ladies and gentlemen, be alert. We are going to initiate a hard-target search for a fugitive in an ever-widening perimeter. We will wade through swamps, prowl Manhattan streets, search every house and doghouse. We'll eat on the run, sleep tomorrow, watch our backs. And since Marshal Sam Gerard leads the hunt, we will experience suspense, action and daring twists every breathless step of the way. Returning to his Oscar-winning role from 'The Fugitive,' Tommy Lee Jones is Gerard, joining an A-team including Wesley Snipes, Robert Downey Jr. and director Stuart Baird. ('Executive Decision') to deliver adrenaline-rush excitement. The suspect: armed, extremely dangerous, perhaps linked to a spy ring. The chase: highlighted by an out-of-control 727, a death match in a ship's cargo hold, a 12-story plunge onto a moving train ,and more heart-pounding sequences. The movie: U.S. Marshals. You can find the latest specs for 'U.S. Marshals' linked from our Blu-ray Release Schedule, where it's indexed under June 5.